“Travel and change of place impart new vigor to the mind." ToXSLains put their best efforts and work hard when we talk about professionalism, but we equally stay energized while we plan trips and outings. 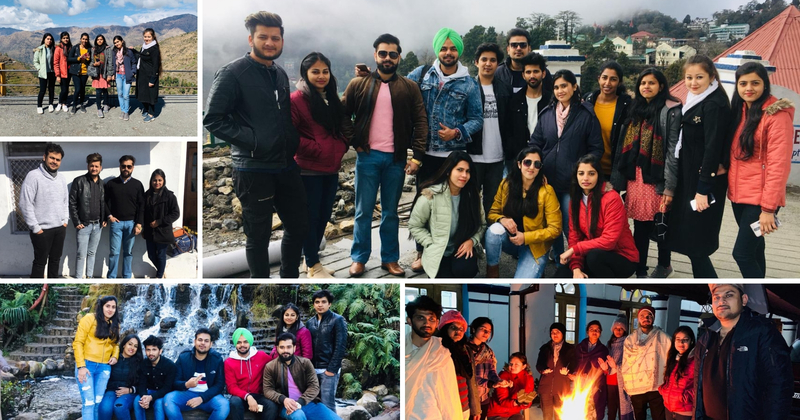 Recently, ToXSL Technologies planned a trip to the Queen of the Hills "Mussoorie". Mussoorie is a very peaceful place located 30 km from Dehradun. The cool weather of the hills coupled with breathtaking and picturesque views which keep changing at every serpentine bend of the road makes Mussoorie so much more appealing than other hill stations. Everyone was waiting for this trip and seem charged up when we finalized this plan. Beginning this trip, all were ready to leave from Chandigarh, all excited and geared up for the trip. Enjoying the music beats, gossiping, and hooting, we enjoyed the whole night drive. In the morning we reached our destination at around 7 am and were surprised to feel the sizzling weather around there in Mussoorie. We didn’t want to waste much time at the hotel, so we decided to move towards Kempty Falls. We all unpacked our luggage, took a break and then got ready. After reaching the falls, our eyes left wide opened, Kempty falls are situated at an altitude of 4,500 ft, on way between Dehradun-Mussoorie road. The beautiful waterfall, which falls from a height of about 40 ft from a mountain was simply a WOW situation for all of us. The falling water, cool breeze, and the peaceful atmosphere, we simply enjoyed the Kempty falls. Now it was the time to move to the next stop, the main attraction of Mussoorie- The Company Garden. Once we entered the company garden, we realized that it was the prettiest tourist destination out of all other places which included more than eight hundred species of flowering plants. At the top, we can even view the mountain top with a telescope and enjoy the beauty of nature. Soon after, we headed to the Mall Road and it made us realize that once we fall in love with Mussoorie, there is no falling out of it. While getting back from the mall road, we headed towards our guest house as we were already hungry. We all gathered around the bonfire by the time dinner was getting ready. A lot of ice-breakers, music, dance, fun, and enjoying the warmth around the bonfire made the night more special. Next day, we all headed to Rishikesh and stopped at the 'Ram Jhula Bridge'. The view from there was ultimate and the weather was mesmerizing. Seeing the view of Ganga river from the very iconic landmarks of Rishikesh =, we could feel the waves of Ganga river. We spent a good time in Rishikesh, capturing tons of memories along with us. In the evening, at around 6 pm, we packed up to leave for Chandigarh. Comforting on our seats, we all headed back while enjoying a memorable and safe journey back! !